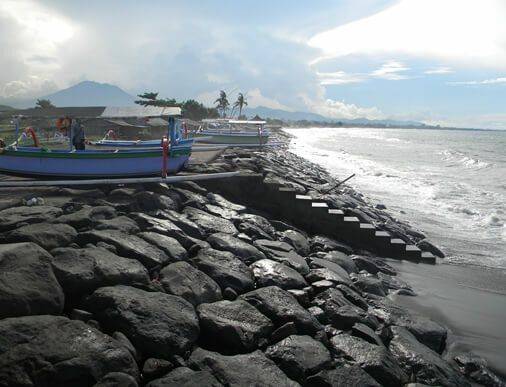 Lebih Beach is located in the Lebih Village, the District of Gianyar, Gianyar Regency. The beach offers a beauty of the nature, Bali Mountains, black sand derived from volcanic activity and direct views to Nusa Penida. The beach is easily accessible by car and takes an hour from Ngurah Rai International Airport through the Jl. Prof. Dr. Ida Bagus Mantra. This spot is supported with broad parking lot. The shoreline is protected by revetment to minimize the abrasion impact. This beach has big waves and can be an alternative option for surfing. Besides that, this place also offering culinary tours. The restaurants serve tasty seafood and local menu along the shore. This is a favorite spot for a holiday or a fun weekend, and is usually crowded by local visitors. The waves here are strong, not recommended for soaking and swimming. The beach is less shade, and hot during the day. It would be better if you visit during the morning or evening. You can walk a bit further from the restaurants to the beach edge. Here you can feel and enjoy the beautiful view of traditional (double outrigger) fisherman's boat moored along the shoreline with the backdrop setting of Bali Mountains, coconut trees, and beautiful sky. It's becomes more attractive especially in the morning, truly dramatic view!